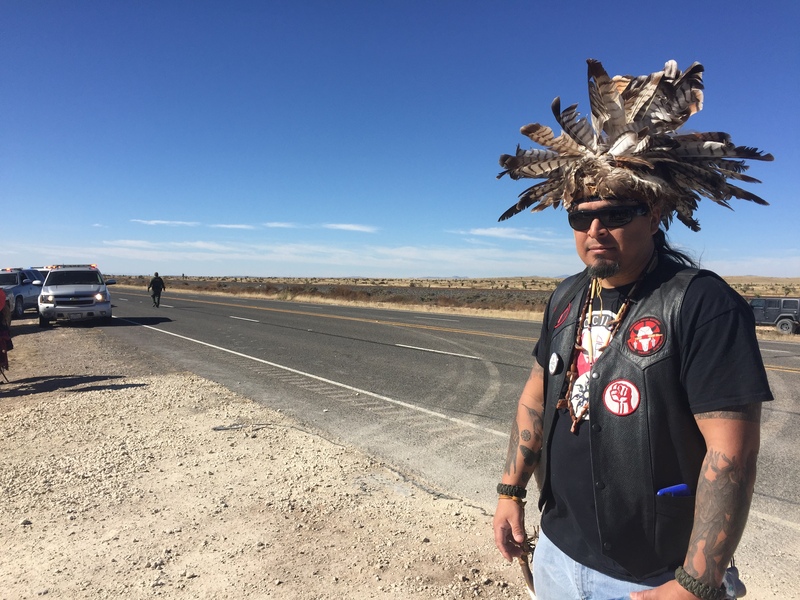 Native American groups and some Big Bend-area residents gathered to protest the Trans-Pecos Pipeline near Marfa on Sunday. Drums mixed with the sounds of heavy machinery as opponents gathered at a construction site for the natural gas project off Highway 90. Activists said at one point about 50 people hopped a fence onto the site. Pipeline opponent David Keller described what happened. 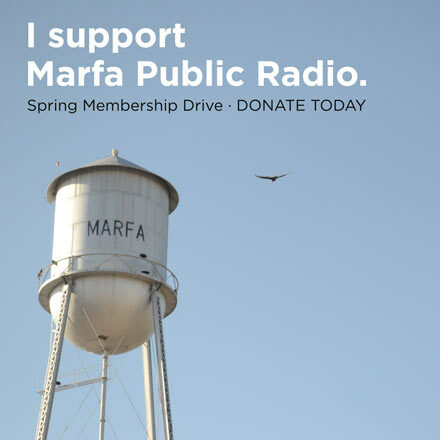 Mark Glover said he was confronted by a Presidio County Sheriff’s Office deputy after stepping onto the site. 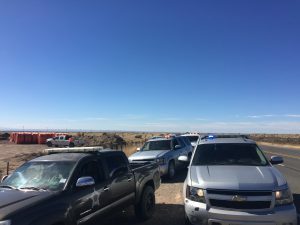 “I might’ve gotten a little too far out, and [Deputy Mitchell Garcia] came over and grabbed me, and pinned me up there by the outhouse,” he said. Video of the confrontation surfaced Monday afternoon. Glover said protest leaders had what he called “negotiations” with authorities, and that ultimately there were no arrests. Protesters eventually moved back off the site to the side of the highway. Presidio County Sheriff Danny Dominguez was later at the scene, but would not comment. Frankie Orona with the San Antonio-based Society of Native Nations was one of the protest organizers. He said he told police to expect more physical action from opponents aimed at blocking the pipeline – similar to what’s been happening in North Dakota with the Dakota Access Oil Pipeline. 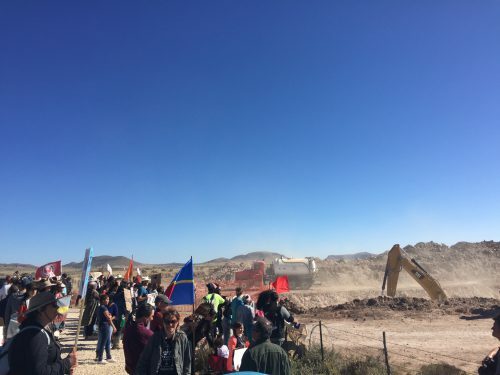 Activists there, led by the Standing Rock Sioux Tribe, have been fighting that project being built by Energy Transfer, the same company building the Trans-Pecos Pipeline. Orona said he also told authorities that pipeline opponents “expect resistance” and also expect some to be arrested in the future, but he asked for different tactics than those used by police in North Dakota. This entry was posted in KRTS News and tagged Big Bend Region, Dakota Access Pipeline, Energy, Energy Transfer, Environment, Industry, Mafa, Natural Gas, Oil and Gas, Pipeline Protests, Trans Pecos Pipeline. Bookmark the permalink.